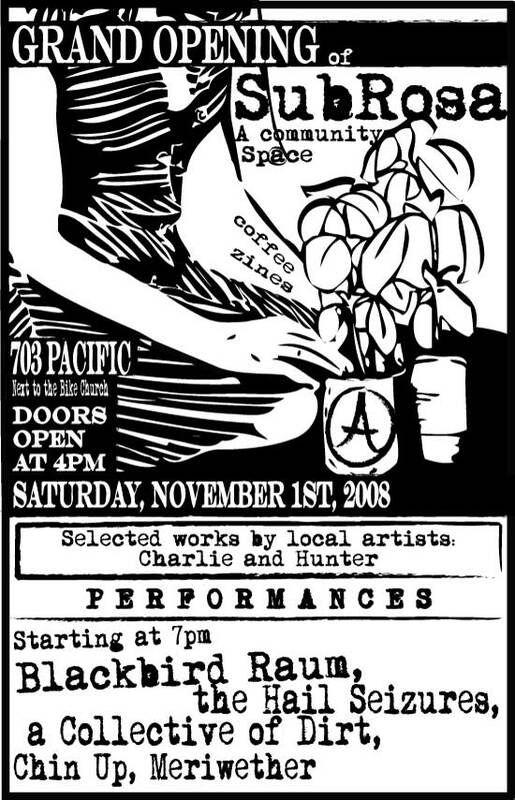 Santa Cruz, CA – November 1st, 2008 – SubRosa, a new community space in downtown Santa Cruz, today announced its grand opening event on Saturday, November 1. The event will include an art show, live music, food, and an exciting first look inside this vibrant new social space. SubRosa is a non-profit, donation-funded space for art and radical projects run by a collective of volunteers from the local anarchist community. It offers gourmet JavaBob’s coffee, anarchist books and literature, performance and a weekly open mic, gallery art by emerging local artists, and a welcoming garden courtyard. Those looking for a good, strong, inexpensive cup of coffee are in luck. SubRosa is a refuge for the nearly extinct $1 cup of coffee served in your own mug. Literature for sale includes anti-authoritarian, ecological and anarchist books and zines. The space also houses the Anarchist Lending Library, featuring books on anarchy, Situationists, history, politics, ecology, indigenous studies, feminism and psychology that might not be available in the local library. SubRosa is located next to the Bike Church, at Pacific Avenue and Spruce Street. Volunteers transformed a run-down warehouse space and bleak parking lot on lower Pacific into a cozy community and performance space with a large patio surrounded by a beautiful garden. Inside and outside, people gather around small tables for coffee and conversation, reading, talking, meeting, and enjoying performances and art. Free wi-fi and public computers are also available for use. A variety of radical community events will be held at SubRosa, including monthly art shows, Free Skool classes and a weekly Open Mic on Thursdays at 8pm. The grand opening events will start at 4pm on Saturday, November 1, with an art opening for local artists Charlie and Hunter, followed by food and a Spoken Word and Freestyle performance at 5:30pm. At 7pm, music will begin with the Hail Seizures, a Collective of Dirt, Chin Up, Meriwether and local anarcho-punk string-band street sensation Blackbird Raum. There will be a $10 donation for the music, but no one will be turned away for lack of funds. SubRosa: A Community Space is located at 703 Pacific Avenue in downtown Santa Cruz. It is open 7 days a week, Mon-Fri 8am-8pm, Sat and Sun 10am-8pm.